Rejoice all you die-hard bicyclists in the Upper Valley: When the snowflakes start falling, you no longer have to be forced inside and sit astride that stationary bike while you watch boring television shows in your living room! “The fat tire bike opens up all four seasons in our region,” says Jason Ouelette, new owner of the bike shop at Mason Racing on Mascoma Street in Lebanon. It’s an ideal location when you consider that within the Lebanon area there are some 105 bike trails, highlighted by the Northern Rail Trail. Fat tire bicycling has taken the region by storm and the Lebanon area may be the epicenter of that movement. Jason’s shop is exclusively for off-road biking enthusiasts and features the wildly popular fat tire bicycles. A fat tire bike is an off-road bicycle with oversized tires, typically 3.8 inches or larger in width, mounted on rims 2.6 inches or wider. Fat tire bikes are designed for low ground pressure to allow riding on soft, unstable terrain such as snow, sand, bogs, and mud. Note there is not a mention of pavement. 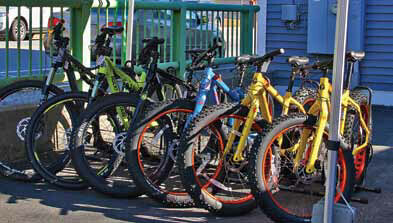 The bikes are well suited for bikers who may have ridden conventional bicycles over the scenic roads in the area but are attracted to the off-road features of a fat tire bike. They’re also perfect for those just starting out. Jason is an experienced rider himself and often leads groups on outings. He’ll also host clinics for those who want to learn more. Getting properly set up with your new fat tire bike is critical for safe and secure riding. This Christmas you can ask for a fat tire bike and rather than place it in the basement until early spring, head for one of the many trails that await the dedicated rider.